46 x pale olive green styrene airframe parts, 5 x clear canopy parts (includes open or closed options) and decals for one subject. Available on-line from Eduard for US$16.95, Hannants for £8.00 , Squadron for US$15.26, Modelimex for €8.54, and Lucky Model US$13.99. Superb kit and tremendously good value. For my money this Weekend Edition of Eduard’s Hellcat is an all-round winner, and definitely recommended to those who don’t want PE (and if you do then buy the Profipack version!). The recent Eduard 1/72 Hellcat kits have been widely reviewed, including here on Hyperscale by Brett Green in August 2011. I could see little point in covering old ground regarding the kit contents, and so refer readers to Brett’s F6F-3 Profipack kit review for comments and images regarding the base kit which is shared with the Weekend Edition reviewed here. Iinstead I will focus more on the “Weekend Edition” aspects of the kit. Whereas the kit Brett reviewed was the “Profipack” boxing complete with all the goodies Eduard does so well (regular and pre-coloured PE details, pre-cut canopy masks and several decal choices), the Weekend boxing is all plastic with one decal option. It’s easy to overlook or be dismissive of the Weekend Edition if you adopt an “I’m not interested in the base model” attitude. But this would be quite wrong because the Weekend Edition Hellcat should be compared to all the other injected non-multi-media F6F kits, rather than its Profipack brethren. When you do this comparison the Weekend Edition shines, as I hope to show. The parts come in a large end-opening box and are enclosed in resealable cellophane bags. There’s some okay computer-generated artwork on the front and a coloured painting & markings guide on the rear. 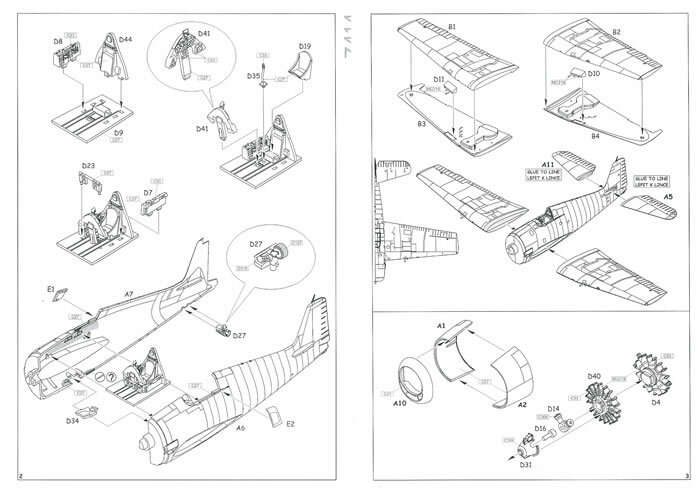 All of the plastic parts are the same as the Profipack option and the instructions convey the same assembly information, but less glamorously with monochrome diagrams on ordinary photocopy paper rather than being coloured and glossy like the Profipack’s. You will end up with some spare bombs, rockets and other bits because several different boxings are covered by the same sprues. The kit decals offer only one option compared to the Profipac’s five. The decals option provided is the widely covered and seemingly ever-popular VF-17, the actual aircraft being that flown by Lt Richard E Stambook in October 1944. The decals are produced to Eduard’s usual very high standards. The major part of this review’s focus will now be on price and value for money, unlike most of my reviews, which usually leave that aspect for readers alone to judge. 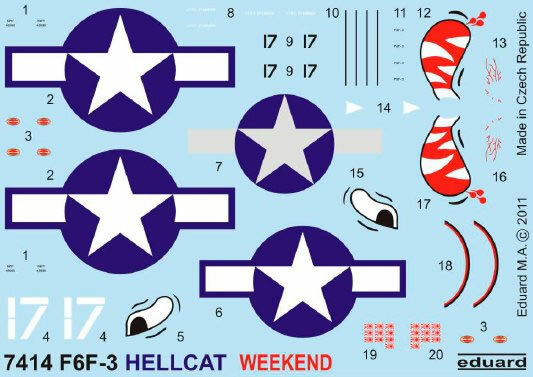 So who is the Weekend Hellcat kit aimed at? Well for starters anyone who does not like working with PE, and there are a few who hate the stuff for being fiddly or needing super-glue to fix it in place. Then there are those who simply do not want or need the extra detail provided by PE. Let’s face it; much of the Profipack detail requires you to get a bit gynaecological in order to see it in this scale, so perhaps being happy with a closed cockpit model wearing a nice paint-job is enough for many modellers. One decal choice probably doesn’t matter to modellers without big stashes of decals, just as it won’t matter to those modellers who do. And of course there’s price, where less in the box really does result in a lower price-point in this case. I think that most will agree that Eduard’s F6F kits are the best in 1/72 by a long shot in nearly all cases, with or without Profipack extras. And there are a few kits out there that have preceded them in this scale to be taken into account - Frog, Linberg, Airfix, Matchbox, Fujimi, Heller/Testors, Hasegawa, Academy, Italeri/Tamiya, Hobby Boss and most recently Cyber Hobby. Near enough equal to Hasegawa and Italeri/Tamiya. If all you’re after is something to quickly dress up in various markings schemes you’d seriously consider Hobby Boss. But if you want a something with a lot more detail and better accuracy you’d have to buy Eduard‘s Weekend Edition. Yes Academy costs a third less, but it lacks the detail and accuracy to stack against Eduard in terms of value for money at only US$5 less. The Hasegawa and Italeri/Tamiya options are substantially inferior for the same price (assuming that you don’t place too great a premium on more decals options, the Weekend Edition’s one weakness). As a slight aside, and in my opinion, the Eduard’s Profipack F6F kits are a bargain as well. 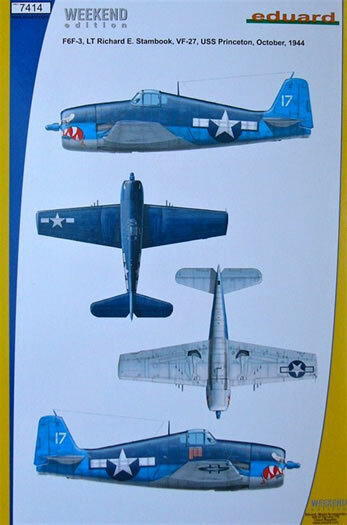 They cannot be compared directly with any of the other F6F kits because none have PE details and pre-cut masks included, although it’s generally about two-thirds the price of the Cyber Hobby kit which has the next best level of detail (and is unique in having a wing fold option). The Profipack is half as much again as the Weekend Edition, but I feel worth every bit of extra money if you want the extra detail and convenience of a canopy mask. The Weekend Edition’s single decal option, whilst less than its competitors provide, doesn’t bother me because I have a big decal bank. But I accept that technically this is a negative in the comparison stakes. I would have thought the options could be widened at little cost if schemes sharing the same national insignia were selected; meaning only squadron codes, personal markings, and tail/wing recognition markings would be extra on the decal sheet already provided. Of course additional printing for an expanded painting markings guide would be required, meaning a little more cost too. The inclusion of a pre-cut paint mask would be nice. Yes the price would go up a little, but the masks are not a questionable detail enhancement, they are a finishing aid that genuinely speeds up painting. I think their inclusion would be most in keeping with the weekend-build sentiment associated with Eduard’s branding. Eduard’s Weekend Edition of their F6F-3 kit is a tremendously good kit, with excellent levels of detail and what looks to be very good fit. It is also generally regarded as the most accurate 1/72 Hellcat available. If you hate PE or don’t require the extra detail level it can provide then this is the kit for you. In fact if the Profipack kits with their extras didn’t exist then Eduard’s Weekend F6F kits would the best 1/72-scale. So this Weekend Edition kit comes in at second, yet it only costs around the same as Hasegawa and Italeri/Tamiya Hellcats, and half the cost of Cyber Hobby’s. It’s not the cheapest F6F, Academy and Hobby Boss cost a third and a half less respectively. But for only US$5 less, buying Academy instead of the Weekend Edition just doesn’t make sense, such is the gulf between what the two kits offer. Hobby Boss at half the price, or about US$7.62 less, could make sense if all you want is a group of Hellcats wearing various markings schemes to display. For my money this Weekend Edition of Eduard’s Hellcat is an all-round winner and definitely recommended. 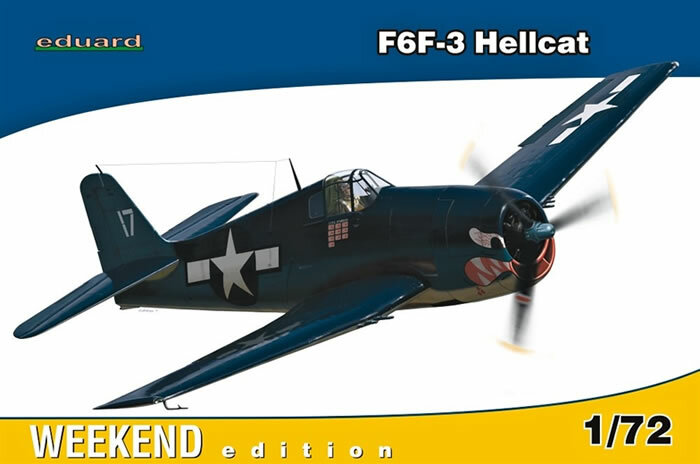 PS: Don’t forget Eduard also do the F6F-5 in Weekend Edition boxing. Just the decals ands box-art will be different from the F6F-3 reviewed here.